Vimeo’s video distribution service has gained a rep in the indie production communities and among bloggers as a favorite video-sharing and embedding site, with its clean, simple interface and good quality Flash encoding. Now, the New York-based company has added the ability to distribute to iPhone/iPod Touch and Google Android devices. This past Wednesday Vimeo announced that its staff picks and HD video showcase, two of the most popular parts of the site, had been re-encoded to H.264. 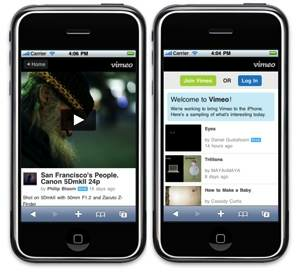 The next step, says Vimeo’s director of community Blake Whitman, is to extend iPhone support to all Plus members over the next few weeks. Avid users include many pro types such as HDSLR pioneer Philip Bloom. The attraction? Rather than the free-for-all mix of high and low, rube and pro of a YouTube, Vimeo feels more like a self-selected club of supportive enthusiasts. This is especially the case among those who buy the Plus membership (the basic site is free). At $60 a year, perks include unlimited HD uploading and the ability to embed videos elsewhere in HD, while users self-police to make sure everyone sticks by rules such as postings uploaded only by actual content creators—no reposted TV episodes here. Vimeo, part of Barry Diller’s IAC empire, will soon relocate to Frank Gehry’s iconic West Chelsea “sailboat” building. While the site faces competition from YouTube (which already re-encodes all uploaded video for smartphones), Vimeo prides itself on listening to its pro-oriented users closely. Expect the Plus site—which is already finding use as a dailies delivery system—to add future products that more closely address the needs of production professionals, says Whitman.